I've slept on mentioning this superb new music-related show (or at least, hopefully it will continue to be superb) because I wanted to wait till closer til it premieres. And here we are -- premiere night -- and I still haven't written anything because procrastination (and family obligations) has kept me from what I love most...sigh. Such is life. "Glee", which premieres tonight on FOX at 9PM, is being described as 'High School Musical' on crack. It follows a handful of misfit kids who love to perform as they attempt to revive a high school's Glee Club to its former glory, with the help of a slightly in despair faculty advisor. Among the kids featured are Lea Michele, who first found footing in Broadway's Spring Awakening, and former member of NLT Kevin McHale (who is almost unrecognizable in glasses and a wheelchair). I had no idea either of these two were involved when I first watched the pilot upon its "early premiere" back in May, but they were certainly welcomed surprises. Aside from the obvious comedy in the show's writing, what I really like is the twisted humor in the choice of musical numbers. The pilot featured full productions of Journey's "Don't Stop Believing" and Amy Winehouse's "Rehab". Another song from the series, a cover of Kanye West/Jamie Foxx's "Gold Digger", premiered on iTunes a few weeks back as a free download. their version of Salt n Pepa's Push It is sublime. Not as good as my karaoke fave Shoop, but still quite good!! 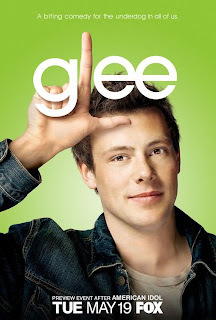 :P I am so so excited about Glee - I have episode 2 to watch tonight. Simon Curtis needs to be on that show ASAP!!!! Did you enjoy your starbucks with your mama?! He's a (former) member of NLT? I had NO idea! Glee is one of only a handful of new shows I'm excited about this season, but I'm so glad to have it that it makes up for the dearth of other good new programming. Paul -- Agreed. Due to complications with my roommates and our shared TV viewing schedule, I didn't get to watch it last night -- so I will be watching the reair on Friday...And OMG if Simon was on it! That would make my life ALMOST as much as if NLT reunited on in it...as if. Haha.